Great to snack on dry. The "Oat clusters dipped in creamy vanilla yogurt" are great, but picture on the box is deceptive - not as many yogurt nuggets as the image would have you believe. The "cranberries" taste more like strawberry-sugar berries, but that's not a bad thing. The cereal packs a big fruity punch. All the good stuff is toward the bottom of the box when you get it, so shake it up real good. It's pretty sweet. Crunchy... it takes nearly 10 minutes before cereal pieces soggy out. Towards the end of the bowl, the berries start to almost seem like a distraction. I've never said this before but this cereal may have just a little too much fruit. I liked it. I didn't love it, but I bet people inclined to like sweet little flavor-infused dried cranberries will love it. I give it a 5.5, which I will round up to 6. Price reflects two (14.7 ounce boxes) for $5.00 sale price. What do you think of Cran-Vanilla Crunch? I loved this cereal so much. It replaced most of my meals and I didn't share with anyone. I would buy at least 2 boxes a week because it went so quickly! Please bring it back. If not, can I have the discontinued boxes?! This was the best cereal in the world!!! I ate it for breakfast, lunch and dinner for weeks. I BOUGHT 4 BOXES EVERY WEEK. I still complain about how they discontinued it. It gets to me every time. Seriously, the best cereal ever created. I want this cereal back! What do we have to do to get Cran Vanilla Crunch back?? It's the greatest thing since the car was invented now I cant find it anywhere if you can find it tell me where and how and do you have any coupons. I loved the Cran-Vanilla Crunch cereal bars! If they came back I'd buy them in a heartbeat. I ate this cereal and I had a (happy feeling) it was better than (whoopie) - other than with my fiance. I too was a fan of Cran Vanilla Crunch. Total does have a new one out called Cranberry Crunch or something like that. It is tasty, but the crunches are not coated in Vanilla and the flakes are different because they are the Total style of flakes. But, it is the closest I have found and it is good too. This cereal was great! I am trying desperately to find it - have looked everywhere. If Kellogg's dumped it - they're fools! This was one of their best cereals! I think everyone here feels the way I do.... I WANT THIS CEREAL BACK!!!! A part of my world was shattered by the disappearing of this cereal!!!! That's for ruining breakfast Kelloggs. This cereal is phenomonal!!!!! Absolutely is heavenly. This is the ONLY cereal that I eat(ate). This is best cereal ever. Kellogg's needs to bring this cereal back. My Husband & I absolutely loved this cereal. I would buy 3 boxes at a time & go through it so fast. Please bring it back!!!!!!!! Like many others here I searched the internet for Cran-Vanilla Crunch only to find it has been discontinued. I agree there was very little (if any) advertising of this Crunch flavor. I happened upon it in a Big Lots and liked it so much I went back to buy two more boxes. But sadly, the next trip it was all gone. Only commercial I've seen is for Raisin Bran Crunch, and sorry Kellogg's, I hate raisins! The cranberry vanilla combination was wonderful. Too bad we can't get it anymore. You should listen to all the people who took time to post comments here!!! Along with the rest of the country, I, too am mourning the loss of my favorite cereal, Cran-Vanilla Crunch. I tend to tire of cereals every 2 weeks or so, but I ate this cereal for months straight until I could no longer find it. I am not an internet person, but I felt I had to express my feelings on this subject. No cereal product out there compares! GRR! This was the best cereal ever! My whole family loved it. The greatest cereal ever!!! I can't believe Kelloggs discontinued it. I bought every box I could find when I found out it was on its way out. It was a sad day when I ate my last bowl. Cran-vanilla crunch was a great cereal. Glad to see I am not the only one who thought so. Had to go back to toast in the morning when it disappeared. Why oh why... what can we do. There's no cereal like this. Can a united front bring it back... Please email Kellogg's and tell them to bring it back. Why did you discontinue the Cran-Vanilla Crunch? Please bring it back. OK. So I havent had a bowl of Cran-Vanilla in about 6 months. I came to the internet to find out how to get it and came across the terrible news. 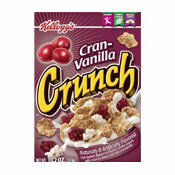 I would pay a premium if Kelloggs re-introduced Cran Vanilla Crunch. What were they thinking. Get your marketing guys together and reintroduce the best cereal even made. I am wholistically disappointed. I went to the Kellogs Crunch cereals site and a survey came up. I typed in that I came for Cran-Vanilla Crunch. Maybe if we all stick together, it will return. It was the greatest. For me, this was the very best cereal in the world. I'm extremly disappointed that you've decided to take it off the market. If cost is an option, I don't believe anyone would oppose to pay a little extra for something that's a real need to have. I ask that you please put this product back on the market in it's original form for all of us who agree. Please bring this cereal back!! It is my all time favorite!! I don't think it was well marketed - the stores in my area only ever had 5 boxes at a time and I always bought 3 of them. I'm sick to death of the cereal choices available now since I've tried this cereal - nothing compares! Bring it back!!!!!!! I'm glad to know I'm not crazy. The cereal was my absolute favorite. I've tried to add cranberries to other cereals. No good! The cereal bars where even better!!! 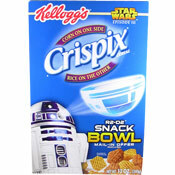 This was my favorite cereal...I scope out the cereal aisle of every store that I happen to go into with no avail. Finally it dawned on me to google it and what do you know?? No more cereal!! AAAAHHHH!!!!! I am not a big cereal person, but that was the one cereal that I actually liked. Now of course they discontinue it. How could they? Oh, I want it back!!!! Just bought the last 2 boxes at Jacks World outlet store in NYC. Check your local outlet stores for inventory. Awww... (darn) it! My boyfriend loves this cereal. It's his favorite! He doesn't believe that it's off the market... =( I don't want to break the sad news to him. I can't imagine how he would feel to know that he'll never eat his favorite cereal ever again... =(((( and I wanted to get him a box of this from somewhere... I'll be rating for my boyfriend... I really wanted to try this product too!!! Thank you for your comments regarding Kellogg's� Cran-Vanilla Crunch�. Consumer satisfaction is important to us, and your interest in our products is sincerely appreciated. This product is no longer marketed by our company, since consumer demand simply does not warrant its continued production. At this time, there are no plans to reintroduce this product. However, as an alternate, you might enjoy a similar product called Raisin Bran Crunch�. We are sending you a coupon so that you can try it! I loved this cereal too. Cant believe they discontinued it. WE LOVE THIS CEREAL!!! If you don't love it, then you're probably eating a different cereal than we are! I mean cranberries, vanilla oat clusters, the best taste in the world. We would never give this cereal a 5, only a 6 or higher! I never ate dry cereal before I found this. I can't beleive it's gone. Bring it back. It took me forty years to find a good dry cereal. What were you thinking? Please bring Cran-Vanilla Crunch cereal back. It was my favorite cereal ever! (And I'm 53). Please consider bringing this product back! Is there anyone out there with boxes left to sell? Maybe another brand could start making it. I'm glad I found this site. I thought I was crazy that I just couldn't find it. I thought it was all sold out. Why Kellogg's, Why? I never loved a cereal before. I can't believe how much I miss the stuff, how many crummy other cereals I have bought hoping they might fill the void, and how sad I am at breakfast now. I even tried to make my own with poor results. Surely those of us who know would pay more for it and make up for the idiots who failed to buy it! Please bring it back. This is my favorite cereal!!! Why would they discontinue something this great?! I e-mailed Kellogs to inquire about the Cran-Vanila Cereal since I can't find it anywhere, and they e-mailed me back that they never made a cereal like that. I guess I imagined eating months and months of the cereal. It is my favorite cereal, they have to bring it back. Where can we find some? I think I am addicted. I am so glad I decided to search for Kellogg's Cran Vanilla Crunch cereal on the internet and found this site. I had no idea it was being discontinued or I would have bought every box in every store. It was absolutely the best cereal I've ever eaten. My entire family just loved it. I just can't understand why it was discontinued. Hopefully, Kellogg's will discover they made a huge mistake and bring it back. This cereal was the best cereal ever invented. I'm surprised that it was discontinued. I think I actually found out about it after it had been on the shelves for a while because i never saw commercials on it. I wish I would've saw it earlier. I will definitely write Kelloggs and let them know there are many of us who enjoyed it and the cereal should be brought back for another trial run. I was glad to find this site and see that I am not the only one so upset over the discontinued status of my all time favorite cereal. I sent an email to Kelloggs asking them to bring Cran-Vanilla Crunch back. I encourage all of you to do the same and just maybe the will give us back our favorite breakfast. My husband and I love the cereal. I can't find any left anywhere. Sadly, I am in the same state as most of you. I fell in love, I mean, I really went head over heels for this cereal (and I'm usually such a raisin bran girl!) only to find out a couple of weeks later that it was being discontinued. I am on my last box, and every bite makes me want to cry, it's so good. Kelloggs, please bring this cereal BACK!!! I was bummed to see that Cran Vanilla Crunch is discontinued (I just checked out the Kellog's site). I am so bummed. It is... I mean, was.... my favorite cereal of all time. What a drag. I seriously need a life. Wow, I have never tasted cereal like this before. Its like an explosion of flavors in my mouth. I agree this is my favorite cereal ever! Usually found it hard to find it at a better price (usually over $4 a box) worth it I think, but it would make me hold out til there was a sale... I too havent seen it lately and am starting to panic. Companies always seem to get rid of my favorites. We should all write to Kelloggs and ask them what happened, and DEMAND that they put them back on the shelves. This is my absolute favorite cereal, but I have not seen it in the stores lately. I like this cereal because the cereals with preserved strawberries taste nasty. Cran-Vanilla Crunch is the best cereal I've ever eaten! My boyfriend buys me four boxes every time he goes to the grocery store since he knows that I go through a box every day and a half. Unfortunately, though, I have not seen it stocked for the past two weeks. Please let me know if there are plans to discontinue it. I am in love with this cereal, and I completely disagree with the person that said it has too much fruit. This cereal is very good, but the cereal bars are even better! I won't reveal #1, but I can tell you it's Gr-r-reat! Click here.